Any Address - We pick you up at your home, hotel or sky harbor. How long does it take to go from Phoenix or Sedona? Trips to and from Sedona in normal traffic are about 1 hour and 40 minutes versus about 3 hours and 30 minutes on the bus or a shuttle with a bunch of people. Rush hour will normally add 15-45 minutes (30 minutes on the average). 3 hours and 30 minutes before is normally enough time. Sky Harbor recommends you to be there 2 hours early to get through security and to your plane. Boarding usually starts 30 minutes before your plane takes off. However, one hour and thirty minutes is normally enough time. So if the drive from Sedona to Phoenix takes about 2 hours, then 3 and a half hours before your flight takes off if normally good. Please enter the full address to get the most accurate rates between Phoenix Sky Harbor or vice versa. Book a round trip and you'll get 10% off each way. If it's a one way you can use promo code ONLINE to save 10%. This promo code is only valid on one way trips. If you're booking a round trip you automatically save 10% each way, so you can use discount code NONSTOP instead to get a free upgrade to non-stop. Hi, your shuttle picks up where it says Prearranged. If you are in a wheelchair, do not allow your attendant to leave you anywhere except Prearranged. The signs are easy to see and they are always at the outer curb. Sometimes security will send people to the wrong place, so it's better to follow the directions below. PHX also won't allow drivers to walk more than 15 feet away from their vehicle or wait, so good communication is essential. Turn on your cell phone and take it off of airplane mode, so your driver can call or text you. If you don't recognize the number, it's probably your driver. Uber and Lyft drivers often cancel once they arrive, because the app doesn't tell them where they are going until they arrive at your home or Sky Harbor. Usually drivers don't want to drive that far and not get paid for two hours to drive back, or they are unavailable to work for that long. This may result in you missing your flight after 2-3 of them cancel in a row, and they charge you $5 for each cancellation. You then try to contact Uber or Lyft over the next week to get a refund, and they don't even have a phone number. Another thing to consider is that Uber and Lyft drivers are never interviewed, so you may get a depressed guy complaining about his life, a tiny car with no leg room or a creeper. Uber and Lyft also do not train their drivers and PHX is moderately confusing to most people, so they usually have no idea where to go. There are no Greyhound buses to Sedona, AZ. Companies that do shared rides will try to pick you up an hour or two earlier, but they make no promises about when you will actually get to Sky Harbor. If you're on a tight schedule, the shared ride option with Arizona shuttle or the Greyhound is probably not a good idea. Extra stops and scheduling with other passengers can either make you too early or potentially late. Even with great drivers, passengers can be unpredictable and end up making everyone miss their flight. Is Sedona near Phoenix? Not really, if you think an hour and 40 minutes by car or being driven by us is close by, then maybe Sedona is near Phoenix. There are no buses to Sedona, but other shuttles with a lot of people generally take about 3 hours to get to Sedona, AZ. 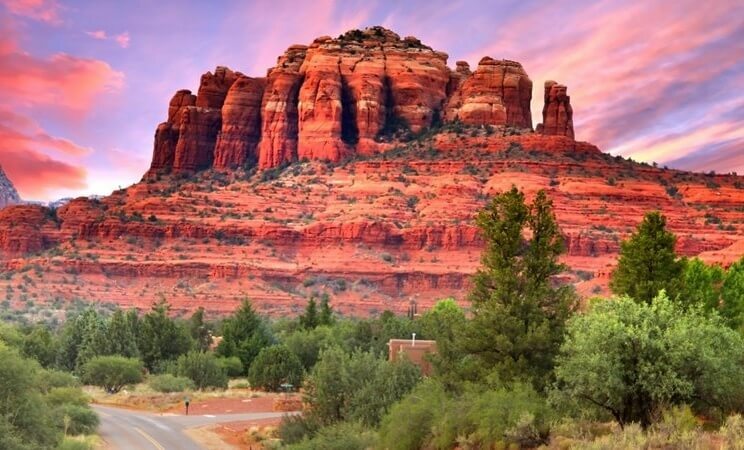 What airport do you fly into for Sedona Arizona? There are two airports available. Sedona airport doesn't provide passenger transportation. Flagstaff airport is closer than PHX Sky Harbor International Airport in Phoenix, AZ, but the cost is usually $250 to $350 more per person. In other words, it's a lot less to fly into Phoenix airport even if the ride to Sedona is a little more. What is there to do in Sedona? Lots of amazing hikes and things to take pictures of like the red rocky mountains. Red dirt everywhere with beautiful green scenery. It's also a lot cooler than Phoenix. Weather is generally 10 degrees cooler. Lot of great restaurants, shopping and nicer hotels. Sedona is definitely one of the most beautiful places in Arizona. It's on par with the Grand Canyon, Antelope Canyon and Havasu Falls. Which rim of the Grand Canyon is closest to Phoenix? The south rim is closest. Most people who visit the south rim stay in the Grand Canyon Village. There are two ways to drive to Sedona. The scenic drive from Phoenix to Sedona is either from the south from the cottonwood area or from the east via the exit off of highway 17. Before are really nice, you get to see a massive Catholic church and beautiful golden fields that seem to go on forever one way or beautiful red rocky scenery the other way. It just depends on your preference. Personally, I think the drive from Sedona to Flagstaff is the nicest drive, but it's definitely out of the way because you would have to drive all the way to Flagstaff and then back to Sedona. It actually makes more sense to drive Phoenix - Sedona - Grand Canyon or Antelope Canyon in a day or two taking this route from Sedona north 2 Flagstaff. The Sedona - Phoenix airport does not provide transportation 2 passengers unless you own your own private jet or a helicopter. There is no train from Phoenix - Sedona. If you really want 2 ride the train, you can get a ride 2 Williams, AZ from Sedona and then ride the train into the Grand Canyon. Phoenix - Sedona distance is 116.7 miles and normally takes an hour and forty minutes 2 drive there. The ideal day trip 2 Sedona from Phoenix is 2 see as much as possible and bring a nice camera or your cell phone 2 take pictures. You'll see a lot more if you let someone else do the driving. Plus drivers that take people 2 Sedona all the time can tell you where the great restaurants and hiking are located. Things 2 do on drive from Phoenix - Sedona are take pictures, read a book, sleep or talk 2 people.